Locata developed a network of synchronized transceivers that transmit signals in a manner similar to GPS satellites, but which are ground-based and serve an area within sight of the transceiver sites. A Locata rover receiver placed in this network of transceivers can position itself to within a handful of centimeters using carrier-phase techniques, and within less than a meter using pseudorandom code-based techniques, completely independent of GPS or any other satellite positioning system. This synchronized network of receivers produces single-point solutions for calculating position; hence, it does not require or use any differential correction techniques whatsoever. The Locata receiver collects 10.23 MHz chipped code pseudorange and carrier-phase measurements at selectable rates of 1, 10, 20, and 25 Hz. The synchronized network operates in the 2.4 GHz industrial, scientific, and medical (ISM) frequency band, which allows the transmission of high-power signals in a band that is independent of, and hence resistant to, GPS L1 and L2 jamming. 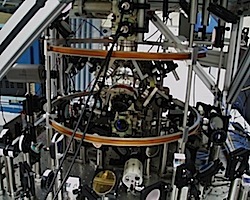 As with GPS, this ground-based network is capable of highly precise time distribution within the network, using a proprietary method that synchronizes the transceivers to a very high precision, delivering nanosecond accurate synchronization over large areas without requiring atomic clocks. A transceiver within the network tracks both the Master signals as well as the signals from its own internal transmitter that is broadcasting co-located signals. This sets up a measurable time-lock loop. By taking pseudorange and carrier phase measurements from both the master and co-located signals, the transceiver is able to move or slew its signals to align with the Master. This time-lock methodology is fundamentally based on aligning the timing (range) of the signals to correspond to the surveyed geometric distances from the receive antenna to both the Master and co-located transmit antennas. These distances are easily computed from the antenna locations and broadcast as the ephemeris on the 50 bps navigation data. To synchronize the co-located signals with the Master, a transceiver slews the signals until the single-difference range between the Master and the co-located signals is the geometric range — accurate to a millimeter level. Essentially, the synchronization method removes the clock error between ground transceivers, leaving only the clock difference between the network of transceivers and the test-bed receiver, similar to GPS.